[While thousands of emergency “philanthropists” have sprouted since the return to civil rule in 1999 – thanks to using such for political gains – there are quite a few in Nigeria for whom genuine philanthropy is not to gain political positions or, worse, to get noticed. I say ‘worse’ because any Giving is eventually good Giving because there are people whose lives are always changed by the Giving instituted by political do-gooders. Professor Olajide Ajayi may, at last, be taking what he and his late wife, Beatrice, have always done on personal and individual cases – to the large stage: a Foundation to help many. The Foundation was started in memory of his late wife as a way of giving back to society in a way that benefits more people than the kind of informal giving generally common among Africans to help family, friends, etcetera. Professor Ajayi seems to live by the dictum that a rich life is not necessarily a happy life if one does not help those in need when one really could. In this write up, Dr. Oresegun tells readers about the Ajayis, her relationship with the family and the event of July 27, 2011 when the Foundation was presented to the public at an Ibadan ceremony. I am really excited to share this with world. I thank you very much for the opportunity your blog provides! Wednesday 27th July 2011 was one day that positively touched the lives of many people including mine in Ibadan. In fact it was a day that changed the lives of some less privileged children. Take for example young “Jane”, a paraplegia for whom a wheel chair gift had her life changed! The sheer joy on her face as she was assisted to seat on the wheel chair was a sight to behold! Jane looked like she was given a million dollars as people would say! She had crawled from her seat to the front to receive her gift and now she was seated in a wheel chair! She has got wheels! She does not have to crawl about on all four anymore! Freedom at last! The person who sat next to me shed tears! It’s sad to say that in a country that is as rich as Nigeria, “Jane’s” plight is a common sight. There are no provisions for the handicapped. Even those who are “privileged” to have wheelchairs cannot access public buildings or even the homes they live in as there are no provisions for ramps to support wheelchair-bound citizens. The provision of a means of transporting themselves from one place to another even within their own homes is of utmost necessity. That is where philanthropists like Mr. Olajide Ajayi, retired Professor of Surgery, University College Hospital, Ibadan (UCH) who started the Beatrice Olajide Ajayi Foundation (BOAF) in memory of his late wife, Beatrice, come in. And to think the cost of a wheelchair that brought this much joy is less than the cost of a nice pair of shoe and bag set for some of us seated there that day is mind-boggling. Ok, so you have worked hard for every kobo you have! So you deserve every luxury you have! Yeah right? Look outside at the hefty man digging a gutter on the road, sweating it out! Is he working hard enough for you? I am sure you can guess his income for the month! Does he deserve the hard life? Is there any reason why you and I have the privileged life and he does not? Don’t say education bla bla…think through and think deep like Einstein would…. I said privilege as in opportunity, environment, circumstances etc. And my point is….? It’s God’s Grace man! Just God’s Grace!!! Sorry I digress….back to Wednesday 27th July event; it was the launching of Beatrice Olajide Ajayi Foundation. Let me say a few words about the charitable organization called BOAF. 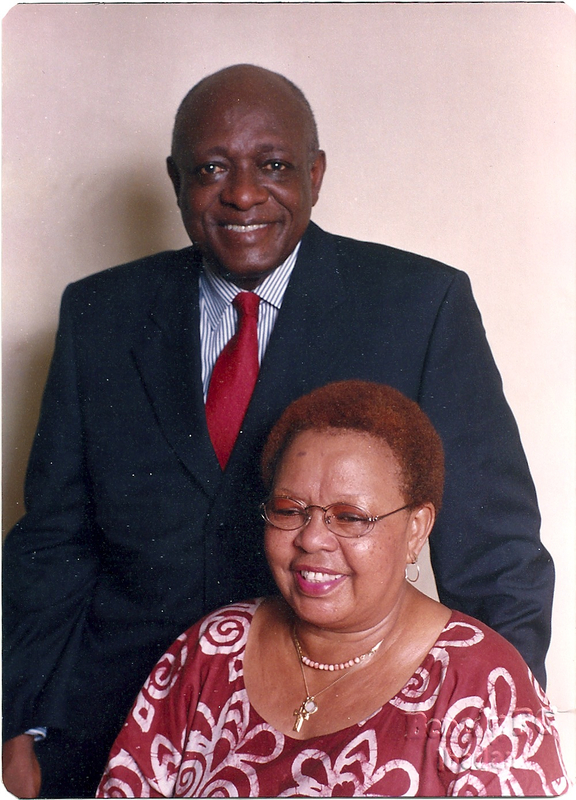 The founders are Prof Olajide O. Ajayi, a world renowned surgeon (yes the former two-time Chief Medical Director of the University College Hospital, Ibadan) and Mrs. Beatrice M. Ajayi an educationist and former teacher and principal of Queen’s School Ibadan. More about them later. i. To assist bright and diligent but indigent students in the pursuit of their education. ii. To assist disabled children and provide relief to children who are victims of natural disaster and epidemics such as poliomyelitis and cerebro-spinal meningitis. iii. To assist charitable organizations such as homes for the handicapped, motherless babies, the deaf and dumb, the blind provided such organizations are registered for the purpose or any such organizations as the Board of Trustees of BOAF may decide from time to time. v. To raise funds through investments, receipts of donations, gifts, bequests and grants from individuals, corporate bodies, organization and other credible sources. vi. To engage in any other activities ancillary or incidental to the foregoing for the Foundation. The Foundation is being run by a Board of Trustees under the distinctive leadership of Dr. Olugbemi Akinkoye, a renowned economist and a family friend of the Ajayis. In present day Nigeria, it is rare to see very comfortable and even wealthy Nigerians (as in civil servants) found a charity to help underprivileged children with their own money. The founders of BOAF have children of their own, but instead of leaving all wealth to their children as it is the norm in these climes, they would rather channel their resources to the larger society where it would be of greater use. The bane of our society is that people usually embezzle government funds meant to improve the lives of the populace! They embezzle not only for themselves but for generations yet unborn! We have so seen greed in all facets of professions that it is nearly becoming the new normal. Have we not seen people celebrate when someone gets elected or selected to government and congratulate the person because it the person’s turn – yeah – his turn to “chop” the people’s money? Chief (Mrs) Beatrice Myra Ajayi was born on the 10th October 1932 in present Delta State. She attended Our Lady of Apostles Primary School in Warri before proceeding to the Holy Child College, Lagos in 1947 and was admitted to Sir John Cass College, London in 1955. By 1961 she had graduated from the University of London with an Honours Degree in Mathematics. She obtained the Postgraduate Certification in Education in 1963 and returned to Nigeria as a mathematics teacher at Queen’s College, Lagos until 1967 when she joined the Oyo State Government as Education Officer teaching at Queen’s School, Ibadan until 1972. She rose through the ranks as Senior Inspector of Education, Divisional Education Officer, Deputy Chief Inspector of Education for Primary and Secondary Schools and Chief Inspector of Education with specific responsibilities in Curriculum Development Research and Planning, and Educational Technology. Finally, she was reposted to Queen’s School, Ibadan as Principal in 1987. She retired in 1989. While her teaching and administrative career provided ample opportunities which touched the lives of many young men and women, her boundless energy found full expression and greater satisfaction in church activities and community service. Beatrice Myra Ajayi utilized, without stint, her immense personality and the sternness of a school mistress in an admixture of love, generosity, compassion and selfless service to steer the girls under her care to focus on their future without seeming harsh. She was more like a mother or an older loving sister. I should know, but a little of that later. She was a member of the Alanu Fund Committee of the University College Hospital, Ibadan, the League of Lay Readers in Ibadan Catholic Archdiocese, Parish Counsellor of SS Peter & Paul Catholic Church, Bodija, Council Member of Development Education and Leadership Services (DELES) and Project Coordinator of the University of Ibadan Village Association (UNIVA). She also served on the Task Forces for the establishment of several Catholic secondary schools. Beatrice loved her family with great passion but as someone who cared little for material possessions and was deeply contemptuous of overt opulence, she not only gave of her time to others but also of her resources. A woman of profound intellect but with an independent frame of mind marked by a streak of non-conformity, yet she adhered strictly to the doctrines of the Church with an abiding faith in God. Born on the 20th of February, 1936, Professor Olajide Olaolu Adedapo Ajayi had his primary education in Lagos and Jos. He attended the CMS Grammar School in Lagos and Sir John Cass College in London for his secondary and pre-university education. He studied Medicine at The Royal London Hospital Medical School of the University of London where he obtained his basic degrees in Medicine and Surgery in 1962. Before returning to Nigeria in 1967, he specialized in surgery. He served as a surgical registrar at the UCH. Within ten years, he had attained full professorial rank in surgery, and consultant surgeon in General Surgery and Surgical Oncology at the UCH. Over the period, he built a reputation in breast and cancer surgery. His innovative approach to the management of cancer by the advocacy of treatment schedules appropriate to developing countries and his fundamental laboratory researches contributed largely to his early national recognition and international reputation. At various times, he was Head of Department of Surgery, Director of Clinical Services UCH, the Provost, the Chief Medical Director of Ogun State University Teaching Hospital, Sagamu and also served for two terms as the Chief Medical Director of the UCH. Prof Ajayi founded this charity in honour of his to formalize their passion which is helping people. I should thank you all for being here to bear witness to the biblical injunction that Beatrice Myra McIntosh and Olajide Olaolu Ajayi must come out to tell the world what great things God had done and is still doing for them whether in life or in death. There is no parallel here to the admonition of Christ to a sneaky lawyer in quest of the definition of good neighbourliness to “go and do likewise” in the ‘Good Samaritan’ story. Both Professor and Mrs. Ajayi are great people with the biggest hearts you can imagine. They give back to the less-privileged from their “normal” earnings. Let’s note that they are not rich people, they are both civil servants who practise what the Lord told us to do – help your neighbours. The Ajayis give love (lots of it); give motivation (lots of it,) and support all these with financial help. Wonderful people! In 1968, place Queen’s School, Ibadan (QSI) Form IV Additional Maths class, I had the good fortune of having close a encounter with our new feisty, beautiful no-nonsense Additional Maths teacher, Mrs. B.M. Ajayi. If I could digress a bit to describe what we thought of Mrs. Ajayi at that time: she was a new fresh breath of teacher, very pretty, dressed very “young” and stylish, spoke very frankly yet with a sense of humour but more engraved in our minds was the fact that Mrs. Ajayi will tell it as it is- truthfully without any fear or favouritism. Suffice to say that we all loved her or should I say we all had a crush on her as in when I grow up, I wish to be just like her!!. Traditionally “Addico” class in Queens comprised of a selection of girls who were good in Maths. Routinely after class, Mrs. Ajayi would give out challenging homework assignment with a promise of monetary reward for whoever got the correct answers. I was good in Maths and won almost every reward. Soon our beautiful teacher noticed me. Oh I need to add that I was 14 years and my father had died 5 years earlier. I think these facts are what made Mrs. Ajayi to take a deep interest in me. That interest deepened by the day, that post QSI, Mrs. Ajayi had “adopted” me as a daughter! I was introduced to Prof Ajayi and the children. I was most welcomed in their home and their hearts. Mrs. Ajayi nurtured me so that I could rise to my full potential and live my best life. She not only encouraged me, she helped me financially and morally throughout my stay at the University of Ibadan (UI). I became the privileged gal and no longer the handicapped gal whose father died too early. I felt I did not lack anything. One thing that is etched in my memory and has remained with me and will remain with me for life is the way Mrs. Ajayi treated house staff (helpers, gardeners etc) with dignity and gratitude which is different from what I had seen around.As a young lady, seeing how happy and dedicated the staffers were, I was impressed that my beautiful teacher was also a compassionate boss. Yes, Uncle Jide and Aunty Bea gave me something immeasurable and inestimable – self confidence, high self esteem and feeling of self worth. I knew I could become anything just by being around them and seeing how highly regarded I was by these two giants – yes, that’s how I saw their achievements. I wanted. And yes my next move was going off to U-California (Berkeley) to pursue a Ph.D degree. Where did I get the audacity to do that if not from my mentors, the Ajayis! When I returned from the US with my husband Sesan, the founders welcomed him like their son-in-law. Instantly the love they had for me was extended to him. In fact Prof Ajayi’s friendship with Sesan was as intense as Mrs. Ajayi’s friendship with me. Thus we became fixtures in their home, and to this day, my husband would tell anyone who cares to listen how Professor Ajayi positively contributed to his life and to the growth of his firm. Uncle Jide and Aunty Bea have impacted our lives immensely not only in their actions but they’ve also impacted our perception of what are really important in life. We are both inspired and often feel obliged to help others because we are beneficiaries of “strangers” kindness and mentoring! As mentioned in the opening part of this write-up, the formal launching of BOAF was NOT just a show but simply formalizing what the Ajayis have been doing for decades. Professor Ajayi founding this and actually putting millions into it for implementation is just amazing and takes generosity to a new level that, hopefully, others in our country can copy. Nigeria would be a better and happier place. A final word: the Ajayis did beget themselves! The four children (can you call people over 40 ‘children’?) are all compassionate and I’m sure they will take BOAF to higher heights. My hope is that the story of the Ajayis has motivated and inspired you to be your brother’s good neighbours. Give back no matter how small the gesture is! LET”S PAY IT FORWARD! !